Teixeira MZ. Homeopathic repertory of modern drugs. São Paulo: Marcus Zulian Teixeira, 2010, 767 páginas. Following the pattern of traditional homeopathy, this work proposes to employ modern drugs according to the principle of therapeutic similitude, stimulating the healing rebound effect (vital reaction) of the organism through the administration of substances (in infinitesimal doses) that caused similar symptoms in healthy human. Is worth emphasizing that the pathogenetic effects (primary actions) of classical homeopathic medicines correspond to the therapeutic, adverse and side effects of conventional drugs, which should be similar to totality of the symptoms of the patient to stimulate the curative vital reaction (curative rebound effect) according to the principle of therapeutic similitude. To make this proposal operative, a Homeopathic Materia Medica of Modern Drugs was elaborated (described in another work), where the therapeutic, adverse and side effects of drugs were grouped following the structure of the traditional homeopathic materia medica, while giving particular value to the frequency of the symptoms observed during the phases of study of the drugs. 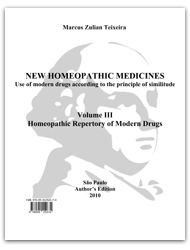 In order to facilitate the selection of the individualized remedy (i.e., similar to the totality of symptoms of the patient), and thus the clinical application of the present proposal, was also elaborated in this work a Homeopathic Repertory of Modern Drugs, where symptoms and remedies are arranged as in the traditional homeopathic repertories.